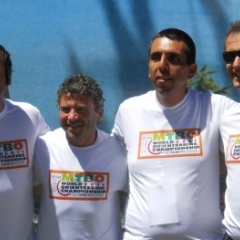 The famous Portuguese Footballer Rui Barros was prestigious testimonial during the World Championships of Mountain Bike Orienteering in these days in Montealegre - Portugal. Barros, talented footballer and sportsman of great sympathy, received the official t-shirt of the next World Championships mountain bike Orienteering taking place in Veneto - Italy, in the province of Vicenza from 20 to 28 August 2011. In Portugal, in mission for the next World Championship were Mauro Gazzerro- regional Chairman FISO Veneto and Gabriele Viale-event manager MTBO 2011. The two have personally delivered the t-shirt to Rui Barros, together with the invitation to attend next year in Berici Hills the event. Rui Barros has played in Italy in the team Juventus coached by Dino Zoff at the end of the 1980s, winning the UEFA Cup. Previously with the team of his city Porto, he won numerous national championships, the Cup Champions and the Intercontinental Cup.